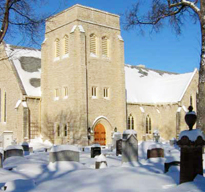 Take a musical journey with The Regimental Band of The Royal Winnipeg Rifles at our annual Spring Concert on Saturday March 23rd, 7:30 pm at St. John’s Cathedral (135 Anderson Ave, Winnipeg). Come listen to the band perform a variety of selections that highlight music from different times and places, including selections from Star Wars, and Godzilla Eats Las Vegas! New this year, past members of our band will be joining us as an alumni band for a few selections in the concert. Stay for a light reception after the concert. Ash Wednesday – March 6 2019, 7 p.m.
Ash Wednesday worship at the Cathedral will be held tomorrow evening, March 6, at 7 p.m. Our worship will include the Imposition of Ashes and the Holy Eucharist. All welcome. Jan Osborne, wife of Bob Osborne, the former Rector of the Cathedral and Dean of Rupertsland (1996-2010) died in Ottawa, 15 Feb 2019. Her family has requested that any donations in her memory be directed to the renewal of the white altar hangings for use at Christmas, Easter and for weddings and funerals at St. John’s Cathedral. Bishop Geoff will be flying to Ottawa to attend this funeral on behalf of us all in Rupert’s Land. As a way of honouring her life and contribution in Rupert’s Land, a Prayer Vigil for Jan will be held @ 935 Nesbitt Bay, Anglican/Lutheran Centre at 1pm on Friday, March 1st [occurring at the same time as the Funeral in Ottawa]. All are welcome. St. John’s Cathedral is searching for a part-time Music Director to play the organ (Cassavant) and piano, direct the Choir/s, plan worship music, and other duties as assigned. Music at St. John’s is founded in the rich resources of the Anglican tradition, while drawing upon the many gifts of the wider church. We worship with the Book of Alternative Services and Common Praise. The goal of music at the Cathedral is first and foremost to give glory and honour to God through Jesus Christ, this by supporting the gathered disciples in the joyful work of Christian worship. Because worship is central for us, we strive for excellence in all things. The deadline for applications is 15 March, 2019. A special service for those for whom Christmas is a time of personal sadness will be held at 4:00 p.m. and includes Rite for Healing and Holy Communion. Family Service with Eucharist at 7:00 p.m. Sung Eucharist (‘Midnight Mass’) at 11:00 p.m. Sung Eucharist at 10:30 a.m. Seating of the Bishop, January 5 – 1:30 p.m. Reception to follow in the John West Hall. When you hear the bells toll on November 11, take a moment to pause and remember all those who served and sacrificed. St. John’s Cathedral will toll its bells at 4:52 pm on Sunday, November 11, joining with others across the country.